Wanna know a secret? Matt and Cat don’t have one but, like many Island folks, they have been privy to all sorts of open speculation about the next occupant of the suddenly vacated Ocean Blue Quay. From Michelin hopefuls to Mediterranean transients and maybe even One of the World’s Best-Loved Television Personalities™ Jamie Oliver (clearly the wildest of speculations): all have been in the frame. Why, Matt and Cat themselves considered stirring up the rumour-mill with a whisper that they would be opening their own eatery there. Imagine! The Island’s tongues would be sharpened to stiletto-like points as slighted restaurateurs queued to give M&C a taste of their own medicine. But be reassured – such eventualities will remain firmly the stuff of fantasy. As it happens, none of the above have become the latest tenants in Ventnor’s newest and shiniest purpose-built restaurant. That privilege goes to Besty and Spinky. Having run a very popular cafe on Ventnor Esplanade for over half a decade, it came to pass that the duo were given their marching orders. The reasons behind this are documented elsewhere and are of no concern to Matt and Cat who are far more interested in eating top nosh in a nice place. So, a month or so after pop-up chef Mourad Sahnoune popped out, the Ocean Blue Quay welcomed its new occupants. Would Besty and Spinky be able to transfer their culinary magic to their new home at the other end of the seafront? The first hot weekend of the year is the day when everyone heads to the coast. Matt and Cat, although residents of Ryde, which has its own delectable beach, decided nonetheless to go on a day trip to Ventnor and try out some of its southern sea air. Ventnor proved to be a great place to bump into friends and fellow bloggers and indulge in retro purchases at the fab Suzes Room. And, as at Ryde, all that parading up and down the hilly High Street is hungry work. Matt and Cat, with a gaggle of friends in tow, trooped down to Besty and Spinky’s to replenish. Like the fairytale heroine Goldilocks, Miss Cat declared the eggs to be just right and gobbled them all up. Having never been to their previous café, Matt and Cat had little idea of what to expect from Besty and Spinky’s. They knew that the proprietors had a good local reputation but, as ever, wanted to check it out for themselves. Parking at a sunny table by the municipal paddling pool – splashtastic entertainment for children for decades – M&C and party let out a collective sigh of sunny-day satisfaction before turning their attention to the menu. Overcoming their desires to proof-read the menu, (“omlette” anyone? ), Matt and Cat were pleased to see a good range of typical café fodder: eggs cooked in a multitude of ways, burgers, meaty stuff and sarnies. Although there was also a good range of specials, breakfast was a popular choice and several of the party could not resist the bargain-priced full English, a range of ubiquitous pork products served with eggs, tomatoes, hash browns, beans, tea or coffee and toast – which also came with jam and marmalade. Matt, who’d worked up an appetite carrying Cat’s newly-purchased Finel bowl, rewarded himself by ordering the Ventnor Bay Special breakfast. Its constituents were the same as in the full English but in double rations and, obligingly, Besty or Spinky (Matt didn’t know which; are they interchangeable like Ant and Dec?) allowed a last-minute substitution of extra hash browns in exchange for unwanted beans. Cat opted for one of her default Saturday lunchtime preferences, scrambled egg on toast. However, in B&S’s café, she was pleased to see a smoked salmon option and eagerly ordered it with a can of coke. While they waited for their lunches to arrive, Matt and Cat fiddled about on Twitter, reviewed their Ventnor wall lizard photos taken earlier that morning and played with Cat’s marine traffic app to see what vessels were in the vicinity so that they could wave to some friends on a cross-channel ferry. Distracted by communications with their real and virtual chums, the time waiting for their meals flew by and, before long, their lunches arrived. Matt’s breakfast was a handsome pile of sausages, bacon, the most perfectly-cooked fried eggs, double hash brown and big fresh fried tomatoes. Two slices of toast and a cup of tea were included: this was a contender for all-day breakfast of the year so far. Cat was delighted with her scrambled eggs and smoked salmon on toast. The big slice of salmon was folded in an attractive manner and garnished with a sprig of parsley and accompanied by a wedge of fresh lemon which Cat squirted over the fish. The eggs, like Matt’s fried ones, were done to perfection: not too dry and not too snotty. Like the fairytale heroine Goldilocks, Miss Cat declared the eggs to be just right and gobbled them all up. Even after the unsurprisingly empty plates were promptly cleared away it was difficult to leave the café. The sun was shining, the company was good and their tummies were full of unsophisticated yet satisfying food. All the friends needed now was an ice cream. Alas, Besty and Spinky’s ice cream freezer was out of action (although with a promise of impending restoration). So, reluctantly, the friends heaved themselves out of their chairs and left the sun-soaked terrace in search of hokey-pokey. They didn’t have to go far to find some. Matt and Cat’s experience of Besty and Spinky’s was great. The food was some of the best of its genre; good quality ingredients, well-cooked and promptly served. The location and, of course the weather, added to this positive review. However, even on the most uninspiring of days it seems likely that you won’t be disappointed at this ‘new’ eatery. ‘Veggie Breakfast Quest’! Wonderful. I’ve not found anywhere on the island that can compete with Sizzlers in Buckland, Portsmouth. Their Veggie Olympic is a taste sensation, complete with bubble and squeak. I’m also on a mission to find the Isle of Wight’s best veggie burger, which is proving an even greater challenge. Like Steve above, we came here after shopping on Fri 23rd Dec, and enjoyed a Full (Veggie) English. I also asked for no beans and had extra tomatoes as substitute. Very good value with the toast/jam/coffee all inclusive. This is now a regular stop on our Veggie Breakfast Quest. Called in after Xmas shopping as fancied breakfast. Had excellent value full English, didn’t want beans and as in your review was asked what I wanted as a substitute, a nice touch. Food well cooked and pleasing to see ocomplete absence of a grease slick swimming over the plate. Not busy when I went (6 or 7 tables occupied) but on strength of my experience would thoroughly recommend for quality of food and value for money. Service also good. Our first visit to the new venue this year, all-day breakfasts were very tasty, nicely presented and reasonably priced. Will definitely return for lunch to try something from the specials board. Visited here last week whilst on holiday, and enjoyed a nice lunch whilst the kids played in the paddling pool! Prices were very reasonable and the quality was really good, so would definitely go again. Being the height of the holiday season we expected quite a wait, but the service was great, and nothing seemed too much trouble. If you’re looking to eat in Ventnor, give it a try! Been home a week after a fort night holiday on the Island and breakfasted at Besty and Spinkys every other day while we were there. Have to say, brilliant breakfasts every time (Not to mention good value for money), the environment is very homely, welcoming and spotlessly clean, and the staff are just so friendly, what more could anyone ask for? As others have said, the menu’s WERE card, and did have food stains on, but during our stay on another visit to Besty and Spinkys, all the menu’s had been replaced with nice shiny laminated menu’s! Hope their new venture succeeds in every way and can’t wait to go back next year. Went in for my first beach breakfast of the year. I had a lovely spot in the sun and really enjoyed my breakfast. The waiting staff were really friendly and my table was cleared promptly. The only downside was the dirty menus as mentioned above. A small point but I do hope the cafe will keep the premises and presentation as good as they were under the previous owners. It is a lovely place and deserves to be kept smart and classy even if it is café food. Went in today. menus were caked in food, which is rather off putting. We were informed the menus were a temporary measure (i.e not laminated and able to wipe clean) as they had just moved in….. first impressions really do matter though and we nearly left on this first impression. Our cokes were served from a bottle which was not refrigerated (left on the side to get warm)so had to ask for some ice. I had the thai fishcakes which were nice and had a nice salad and dressing with it. One of the party had bangers and mash which he informed me were ‘ok’.My parents each had a sandwich which they informed me was nice and fresh but could have done with some garnish on the side or something. Over all the food was nice but these little lack of attention to simple details will probably mean we would not return but would try another place when next in Ventnor. We went to Besty & Spinky’s yesterday, and Geoff had the “all day breakfast” – veggie version, and tomatoes on toast for me. Great value – the breakfast included toast & preserve and tea or coffee. The tomatoes were lovely, really tasty and juicy. We reckon this is the best ADB on the Island so far, specially for us veggies. Lovely weather helped. Great location. Great food. Fantastic that Besty & Spinky found somewhere so great to relocate to. Still doing the ” don’t like this so swap it for that” which is so popular with Ventnor bay cafe customers in the past. Delighted to seem the boys are relocated in such a good position. The food was always superb. The boys had (and still have) an unbeatable business model of good quality food, well cooked and with friendly service. Having been regular visitors to the Ventnor Bay Cafe for years, the family went for breakfast on Thursday 7th April to try out the new venue, it was fantastic. The food was wonderful,as always,the service prompt, the menu even more extensive, trendy indoor space, as well as lots more outdoor tables, great views & sunshine, what more could we ask for. We were back on Saturday for another treat, well done to Besty & Spinky. Thank goodness, something affordable for families next to the children’s paddling pool! 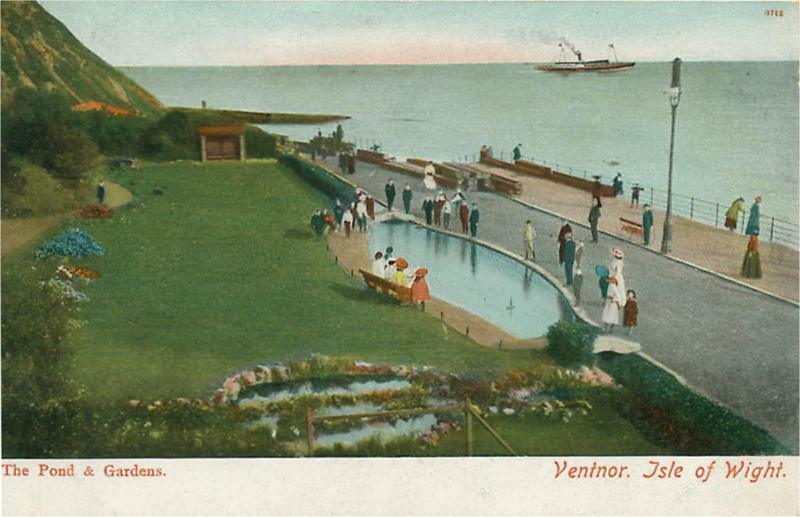 Loads of Ventnor families and visiting families head down here after school on sunny days, and of course weekends and holidays, and the previous operation was way out of the price league for ordinary people on ordinary days (maybe OK for visitors or special treats) who just wanted something to feed a hungry family, or a regular price icecream! This sounds like the perfect cafe in the perfect location, good luck to the new people.